Compression and Overdrive are the foundation of my engineering. These two Keeley tones have inspired countless musicians, now they sit in one extremely versatile, sonic tool. The Aria Compressor Drive not only offers out most flexible overdrive to date, it has all the tone and blend features of the Compressor Plus. Players also have the ability to swap the order of the compressor and drive for two very useful drive experiences. Two-Mode Overdrive: Soft clipping and a transparent boost to midrange frequencies, perfect for defining your own voice. Dual Mode – Clean and Transparent or Heavy Saturation! Clean and Bold in Low Mode – Focused and Sustaining in High Mode. Compressor with Clean Blend and Tone Control – Blend in any amount of clean signal for punchy chord work and use the Tone Control to brighten the highs. Plus Features: Tone and Blend – Perfect for Humbuckers and Single Coils! Blend for Manhattan style compressor and Tone for treble boosting. Use TRS insert cables to place effects between the Compressor and Drive like phasers, wahs, or other dirt boxes! Compressors and Overdrive are a fundamental part of the guitar recording process. They are also essentials for live guitar performance. You have two ways you can combine the beautiful midrange of overdrive and the benefits of compression and sustain. Most people run compression before overdrive in order to reduce the potential for idle, static noise. There are times when you want added sustain and therefore might need the compressor after overdrives, because using compressors after overdrives offers players a very warm and rounded, smooth and even tone with tons of sustain. And then you may need to return to the conventional routing, because compression before drives gives you a consistent gain level. Problem solved! 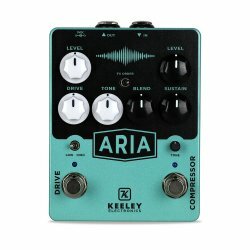 Each half of the flexibly routed Keeley Aria Compressor Drive provides tons of volume for boosting and pushing your amp, with each half offering essential tone shaping controls to perfectly sculpt the core of your guitar’s sound. The Aria Compressor Drive comes with TRS insert jacks to allow you to divide the pedal into two units. Insert effects between the two sides! Compressor into delay into overdrive, anyone? Maybe swap that for overdrive into delay into compression. For nearly two decades, from nearly every Nashville session-ace to the praise and worship player at church, from Steely Dan, Steve Vai, Johnny Hiland, Daniel Donato, Arianna Powell, to Nicholas Veinglou, the Keeley Compressor and Red Dirt have been a part of these performing, recording, and touring sounds. Now, these two epic tones are together in one stomp box that is easy to use and full of features.